My business card says Owner / Vice President. So everyone thinks all of our team members work for me. But that is wrong. Our associates carry our business on their shoulders. Everyday. Good times and bad. No matter what the situation is, our team members go the “second-mile”, serving our guests (you)! Our associates don’t work for me. They work for you, our guests who are our clients! Doug Gulleson, MBA, MAHD, Doug was born and raised in Indonesia as a Third-Culture Kid (TCK). He graduated in 1986 from the Jakarta International School. 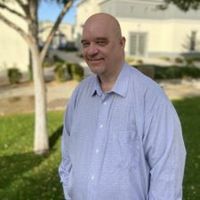 After serving in the U.S. Army, Doug moved to Arizona in 1997 and earned a Bachelor’s Degree in Business at Western International University (WIU). Doug started working full time with Good Neighbor Insurance, Inc. in 2000, and is now Co-owner. In 2002, he graduated with a MBA in International Business from WIU. Doug also sits on the Board of Directors for a non-profit overseas. His major hobby is scuba diving and underwater photography. He has dived off the coasts of countries like Indonesia (Bali and Northern Sulawesi), Thailand, Australia, Papua New Guinea, Solomon Islands and the Caribbean. “Wearing many hats” is the ‘fun part’ of being co-owner of Good Neighbor Insurance (GNI). But under all these hats, the same theme always echoes throughout my day – “People are the Destination.” My internal clients – our talented associates, and our paying clients -our “guests,” is what it is all about. Because, I have traveled, lived, and served overseas (like most of our associates), I know what that means when our clients are traveling, busy, trying to connect to the internet with sometimes spotty service and preoccupied with serving others, or other important details. I get it. That’s why we’re glad we can help them. We are growing as an international insurance brokerage firm, but have an extended “family-like” feel. Why? Because that’s how I grew up, the culture I grew up in. 3.) Doug, where have you lived or visited? What did you like about it, and what did you learn? Wow! I could write a novel on this part alone. Where should I start? I was born and raised in Indonesia for 19 years. When I graduated high school at Jakarta International School in 1986 I came home to the U.S. As a TCK (third culture kid) I felt like an immigrant in my own country. I served in the U.S. Army. But that type of travel, even though it made me a man, was not the traveling I am most fond of. Now I travel throughout the world, mostly SE Asia, to enjoy my other passion besides work – I love to scuba dive and am learning underwater photography. I have dived most of the best places in Indonesia and going for my 2nd visit to most places there. Other places I have dived – Australia GBR, Solomon Islands, Thailand, Cayman Islands, Bahamas, and Bonaire. Learn to be a better underwater photographer so I can share that amazing, often unseen, beauty with others. Create a non-profit business to share diving with those who have lost a major body part, or who are paralyzed. The freedom diving gives to a person is unbelievable as well as share with others the beauty that is underwater. Meet a great white shark – yes (with me in a cage) for sure! But I want to see a great white close and personal without risk of losing any of my body parts, or having to use my international health insurance benefits! Over the years I have learned some things that have helped me make my travels as stress-free as possible. Travel is an adventure-But it is also should be fun. So when things don’t go as I planned, I try to remember that and make the adventurous/hassle-part of travel more fun. “Perception is reality” – even without wifi! Bring one paperback book, because sometimes your kindle runs out of juice. If I am taking a quick 3-day trip from home, I take a picture of the location I parked my vehicle. For example, I see the pillar or parking number and take a quick picture on my iPod or iPhone. This way I can find it again, since writing it down seems to always get lost when I need it. Passport and wallet – Each place I leave like the airport, hotel, or vehicle, I get a visual where they are in my bag. It’s a habit now. Along with the above, I make sure to put my most valuable items (like passport, wallet, and folder with key papers) in the same place throughout the trip. It is easy to just “throw” my passport into the nearest bag compartment but that would cause a lot of frustration if and when I can’t find it quickly. Let alone the “heart-attack” thinking I lost something when most needed. Don’t order, or drink anything with, ice no matter how clean you think the place is. Just get a cold bottle of water or a cold sealed drink. I enjoy the bedroom, or being out visiting, over the bathroom any day. And this one is especially for me: Make sure you know when your next stop has decent wifi. Yep, I know. This is terrible of me. But I am part of this great world of ours and need WiFi! – Plan ahead. Lastly, don’t carry your (usual) wallet around when enjoying the area. Put the wallet and passport in your room safe. I take one of those black clips and carry no more than USD50 with me.